This apple dip with pie crust chips is a deconstructed apple pie. It has all the flavor of a homemade apple pie, but with a difference: it's served as an appetizer. It's the perfect snack to offer at a fall or winter party or game event. 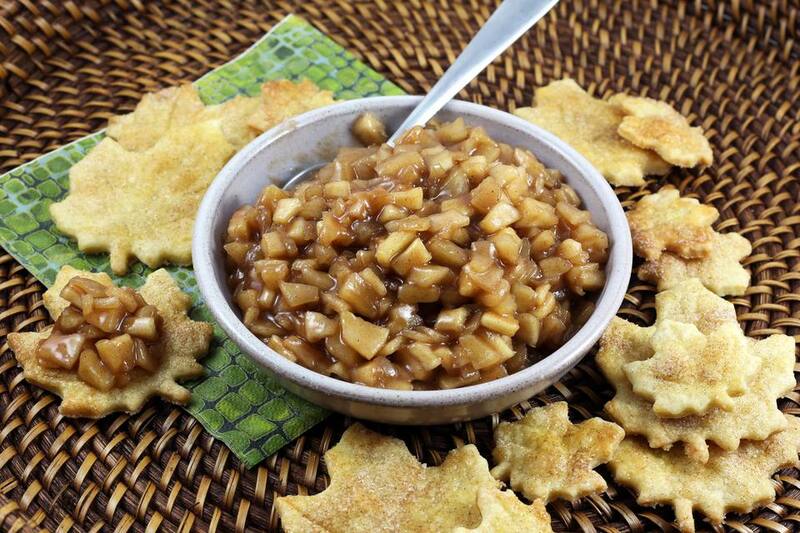 Serve the apple dip hot from a bowl or keep it warm in a 2-cup or 1-quart slow cooker. Peel the apples, core them and then slice into wedges. Dice the wedges. Put the diced apples in a medium saucepan with the lemon juice, brown sugar, 2 tablespoons of flour, corn syrup, 1 tablespoon of butter, and 1 1/2 teaspoons of ground cinnamon. Stir to blend thoroughly. Bring the apple mixture to a simmer over medium heat. Lower the heat to low and continue cooking, frequently stirring, for about 12 to 16 minutes, or until the apples are tender. If the mixture is too thick, add a little water. In a food processor, combine the 3 cups of flour, salt, baking powder, and 3 teaspoons of sugar. Pulse to blend the dry ingredients. Add the butter and pulse about 6 times, or until the butter pieces are about the size of small peas. Drizzle about 8 tablespoons of ice water through the feed tube while pulsing. Add more, as needed, until the dough begins to form small clumps. Turn the dough out onto a floured surface and shape into a flattened disk. Wrap in plastic wrap and chill for 10 to 20 minutes. Roll the dough out about 1/8-inch thick on a floured surface. Cut out leaves or other shapes and arrange them on the parchment paper-lined baking sheets. Combine the egg and 1 tablespoon of water; whisk to blend. Lightly brush each pie crust chip with the mixture. For leaf shapes, use a toothpick or skewer to lightly trace veins onto the leaves. Combine the 2 tablespoons of granulated sugar with the 1/2 teaspoon of cinnamon. Sprinkle over the pie crust chips. Bake the pastry chips for about 15 to 18 minutes, or until firm and lightly browned. To serve, reheat the apple mixture and serve warm in a bowl along with the pie crust chips. The recipe includes a homemade food processor pie pastry, but you may use two sheets of refrigerated pie crust.